This is a work in progress. I will continue to add to this and make corrections as I have time. The focus on wearing helmets has, in my opinion, been quite detrimental—to our health, safety, and environment. It has taken the focus off of far more important safety measures such as building safe protected bikeways and it has discouraged people from riding which is far more detrimental to our health than any harm from not wearing a helmet. There has been some controversy over my recent comments about wearing or not wearing bicycle helmets. Here are a few very quick (or not so) points on this. Firstly, I do not encourage people to not wear bicycle helmets. However, people should know the realities of bicycle helmet effectiveness. They should know that it is OK and safe to ride without a helmet. And especially to do so rather than choose not to ride because they don’t have a helmet, can’t find it, or simply don’t want to wear it. People should have the freedom to ride a bicycle without being berated for whichever they choose. As we’ll see, both are quite logical choices, and whichever someone chooses likely makes little difference beyond personal preference and fashion. Our intuition tells us that foam bicycle helmets should be effective in preventing traumatic brain injury (TBI), the reason that we are told to wear them. In reality this has not shown to be the case. We are often told to take something we hear with a few grains of salt. Wise advice. Here are a three grains of salt for bicycle helmets. 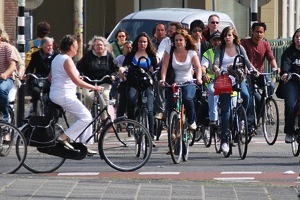 1 – Bicycle riders in The Netherlands, Denmark, and elsewhere do not wear helmets. And yet, with all of their bicycle riding, they do not have higher rates of Traumatic Brain Injury (TBI). In fact, they live longer and healthier lives than we do. 2 – Of the studies of population-wide increases in helmet use, none that I am aware of have shown a corresponding causal decrease in rates of TBI. They consistently show no statistically significant change. 3 – Head injuries as a percent of all bicycle injuries are the same in The Netherlands (32% of all injuries) with zero helmet use as in the U.S. (33%) with high helmet use. Minnesota, with very high helmet use, has an even higher rate of 37%. If bicycle helmets were effective then these should not be. Everything we hear in the U.S. tells us that The Netherlands, Denmark, and similar helmetless countries should have massive numbers of head injuries and fatalities or that if people start wearing helmets fatalities will decrease. Yet neither of these has proven true. The big smoking gun though is #3 because that takes all other factors, such as Europe’s safer roads and drivers, out of the equation. It looks only at helmet effectiveness and indicates that helmets have no overall affect on reducing brain injury. Now, let’s look a bit more in depth.